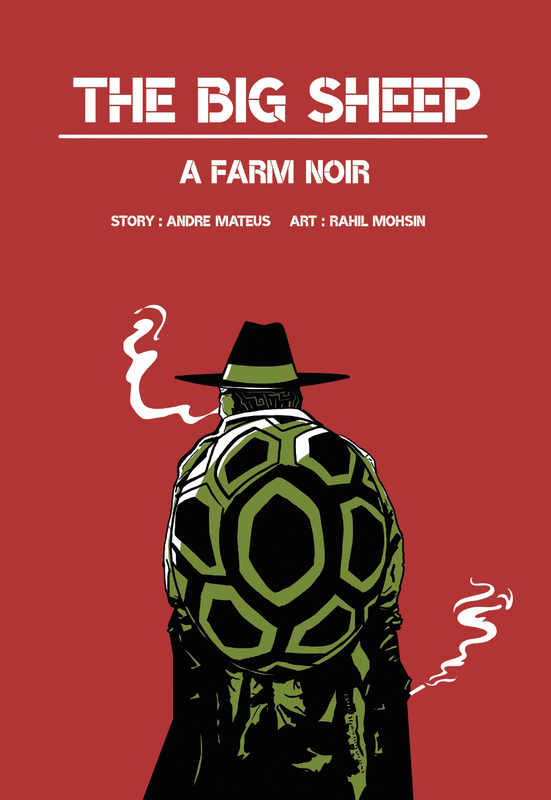 The Big Sheep is a farm noir, and by that I mean it’s a noir story involving anthropomorphized farm animals and a mystery (because it wouldn’t be a noir without a little mystery, now would it?). Our main character, Slow Spade, is unsurprisingly a turtle; he’s also a private investigator though the times have been a little been a little rough on him lately. Slow is good at what he does, contrary to popular belief. It may take him a while to solve the riddle he’s been handed, but he’ll always figure it out, and he’ll have the correct conclusion to boot. Though I can understand why a client with an urgent case (one that needed to be solved asap) may look for another investigator first. It wouldn’t be a true noir telling without a romantic conflict, so who does Slow have arrive at his office, none other than his lovely ex, Linda Sheep. Seeing the one that got away suddenly appear at your door…that would create a whirlwind of emotions for anyone. Having your ex at your door, asking for help finding her step-daughter from her current marriage? That would be worse. But money is money, and Slow sure needs it. So even though he’d rather not take the case, he has too. Unfortunately, the man (well, Sheep really) Linda married could really be considered another type of animal (let’s say a donkey), but he’s rich, and apparently that’s enough for Linda. On the bright side that means that Slow will actually be getting paid (and well) for once. So now we’ve got the plot, the (ex) love interesting, and the jerk, all we’re missing is the competition. Oh wait, no we’re not. The jerk (sheep husband) apparently didn’t think a turtle could get the job done, so he went and hired Mad Dog Marlowe to look for his missing child (not that I think he actually cared about her missing…he certainly didn’t seem worried). This is the guy that’s been taking most of the cases (and thus money) from Slow. I hate him already. The unlikely duo team up (well, sort of) in order to share the clues of the case. What happens next is pretty typical for a mystery, tracking down clues, questioning witnesses/anybody else that’s relevant, and so on. Though of course there’s an added flair thanks to the animal element. This was a pretty clever and fun read. It appears to be a short story, and it’s only twenty pages long, so it doesn’t require much of a time investment at all. The author did a pretty good job of keeping the tones perfectly suited for a noir telling, and it shows. I wouldn’t mind seeing more from this world, given a chance. I love the art style chosen for this story. It’s all in black and white (with the exception of the cover, which I love), but that just adds to the feeling (after all, weren’t all the classic noir stories told in black and white? It fits). The thick lines used really supports the feeling of this series – it’s darker and edgy, but doesn’t quite cross the line into brooding. It weighs down the eyes and thus the mood, which is pretty perfect in this case. To see more about the Big Sheep, click here.